Capt. 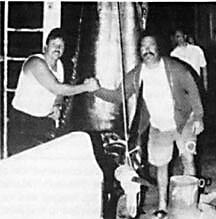 Guy Bagda of the ANNA II, a 24-foot Radon, raised this monster marlin while trolling a spread of lures near Mauis JJ-buoy. John Eddy angled the brute using an 80W Penn International reel and 130-lb test line. This was Johns first marlin and a new Maui County record.